We have noticed a lot of our readers are from JBR so we thought we would get some interaction with other readers and tell them more about this wonderful place… Launched in August 2002 by Dubai properties. The 6billion dollar project was completed by 2007 but not officially opened and disclosed to residence and tourists until August 2008. Today JBR is a very popular area for many things…. Let’s take a look at a few of these aspects…. JBR (formally knows as Jumeirah beach walk) is the worlds largest single phase residential development, with it’s 40 towers -35 residential and 5 hotels (a growing number) , it has that community and touristy environment. Situated in the Marina area of Dubai, it runs along a beautiful 1.7km waterfront! 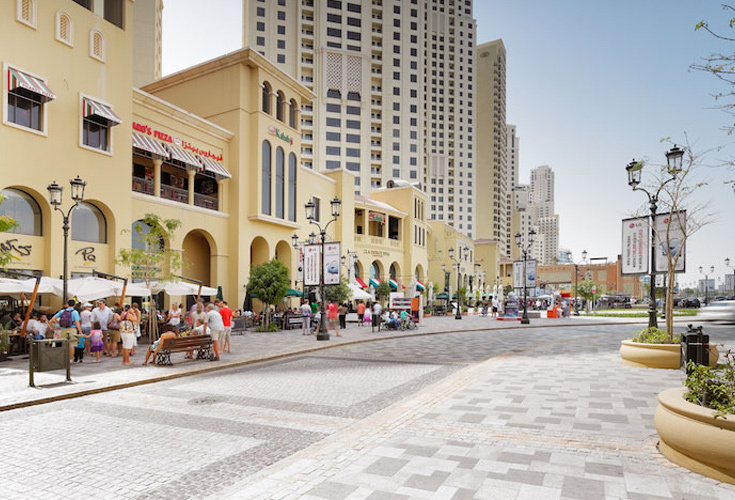 These days it’s just not the towers and waterfront that makes our well known JBR, there is also a range of restaurants, cafés, a cinema and a shops in the mall area. The walk is the perfect place for a couples honeymoon or break, a beautiful place to bring your family for a day on the beach and a cool Starbucks with a view! A sophisticated cinema, children’s play areas and simply mouth watering restaurants, there’s always something to indulge in! JBR has a different approach to your typical marina area, the dynamic Mediterranean theme and local architecture makes it stand out as a place everyone wants to see! With the marina yacht club just around the corner, a fresh sea fish restaurant that serves only the freshest fish and the soft white sand at the sea, one could easily get lost amongst it all. With access to the metro line so close, you can easily escape to see the city!! Comments Off on James and HIS Dubai!